Ayodhya:The three days Deepostava programme to welcome Lord Ram, Sita and Laxman to Ayodhya would culminate here on Tuesday with lightning of over 3.35 lakh diyas ( earthen lamps) and laying the foundation of a Memorial on the name of Korean Queen. Though Chief Minister Yogi Adityanath is also slated to lay the foundation stone for a over 150 meter tall Lord Ram statue, but there is no such official confirmation yet.The construction of a 151 meter tall statue of Lord Ram in the Ayodhya city would be constructed at a cost of Rs 330 crore. According to sources, the grand statue of Lord Ram will be erected on the bank of River Saryu. 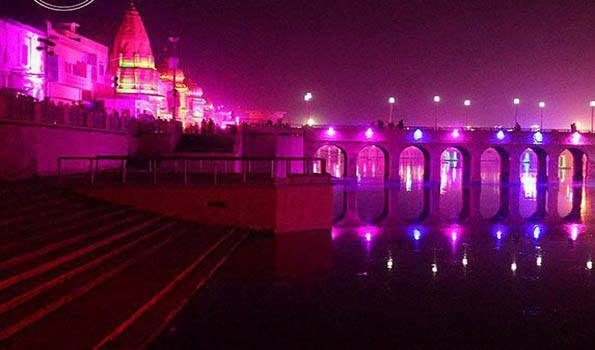 From a dazzling riverfront at the 'Ram Ki Paidi' to illuminated streets and heritage buildings, Ayodhya city has been fully decorated to welcome the visiting South Korean First lady Kim Jung-sook for the grand Diwali celebrations here. Ms Kim and CM Adityanath will jointly lay the foundation stone for a riverbank memorial to first-century Korean queen Heo Hwang-ok, who legend says was a princess of Ayodhya. According to legend, an Ayodhya princess had visited Korea in AD 42 and was given the name Heo Hwang-ok after her marriage with King Kim Suro, founder of the Korean kingdom of Karack. Special trained 'Divyang' students will sing the welcome song for CM Yogi Adityanath, the South Korean First Lady and other dignitaries after their arrival here. A statue of Lord Ram and Hanuman has also been installed at the historic ghats of the Saryu river, while an iconic ceremonial gateway has been erected near the site of the main function. CM Adityanath has been organising ''Deepotsav'' - a carnival of lights - in Ayodhya on Diwali since becoming Chief Minister last year. On the occasion, lakhs of 'diyas' (earthen lamps) made by the potters will be lit up to welcome Kim, while also aiming for a Guinness Book of Record. The South Korean First lady will also light the lamp made out of waste materials. The lamp is made by the fine arts department of Ram Manohar Lohiya Awadh University and has intricate designs on it which showcases Awadhi tradition and culture. The size of this lamp is around four-and-half feet and a team of 25 students created it over a period of 20-25 days. The potters of Ayodhya had worked round-the-clock in Jaisinghpur Konhariya village. Artists from Maharashtra have worked on 30-ft statue of Lord Ram, installed near the site of 'Deepotsav'. Huge hoardings, bearing the message - 'South Korean First lady Kim Jung-sook - Welcome to Ayodhya ' and her picture, have been put up across the city.Kim, already arrived in Lucknow on Monday when chief minister Yogi Adityanath welcomed her at the Amausi airport and later held a dinner for the foreign dignitary.According to the programme of deepostava, between 1130 to 1530 hours, a Grand Shobha Yatra depicting the different episodes of Ramayana. Shobha Yatra will reach Ram Katha Park in 4 hours. International artists from Korea, Russia, Laos, Trinindad and 500 Indian folk artists shall be participate. Starting from Saket Mahavidyala and covering prominent places of Ayodhya, the Shobha Yatra will end up at Hanuman Gufa. The First Lady of Korea would be welcomed by Chief Minister and other Dignitary would be held at 1500 hours and later they will inaugurate Ram Bazaar and Sand art of Sri Sudarshan Patnaik in front of Ram Katha Museum. At 1515 hours floral tribute would be paid at Queen Hou Park by Governors of UP Ram Naik and Bihar Lalji Tandon, Chief Minister of Uttar Pradesh amd Mrs Kim Jong Sook. Thereafter cultural presentation would be made by Korean Troop, Indian Cultural Troop which will be followed by speeches of the Cultural Minister of Republic of Korea (Jong-Hwan, Do), UP Chief Minister of UP and ground Breaking Ceremony of Queen Huo Memorial by Chief Minister and First Lady of Korea. At around 1600 hours, programme of descent of Lord Ram, Sita and Laxman by a chopper to be depicted as Pushpak Viman. There after abhishek and aarti of Lord Ram, Sita and Laxman and other programme would be done at the Ram Katha Park. After a brief rest, the dignitaries would reach the Saryu river bank for Deepdan and Deepotsava programme at Ram Ki Paidi where lighting of 3,00,000 Diya's to create an attempt for Guinness Book record would be made at around 1830 hours. A big diya will also be lit through remote.